personalities inside a Card ... Sent to you, or directly to someone on your behalf! 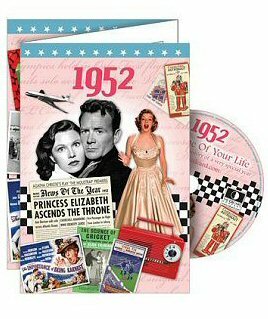 Our DVD card with envelope contains a full-length exclusive, exciting documentary about your chosen year, featuring top news, events & personalities. This distinctive commemorative gift celebrates your year in a way that will certainly evoke all sorts of memories of the time - a great way to bring the past back to life! Ideal for marking any occasion or event in the past, wedding anniversary, birth year etc. We can send the card to you unopened, or directly to someone else with your message inside!